Sometimes, when you’ve got a good thing, you just have to show your gratitude for it. 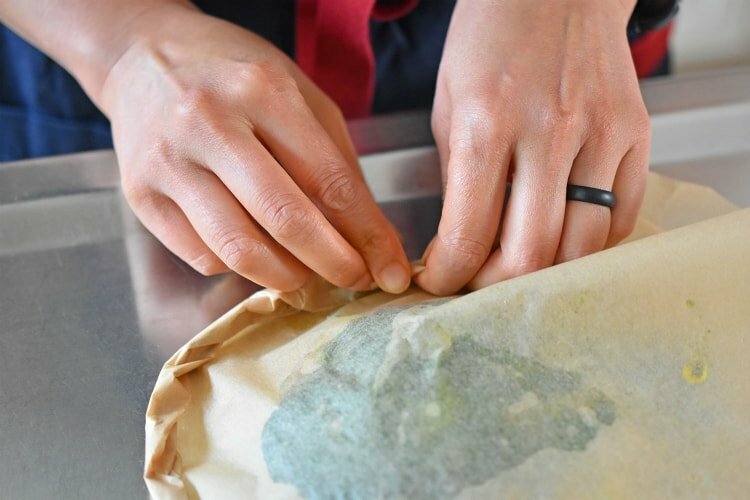 That’s how I feel about my chef sister Fiona’s zingy, herby green marinade—a recipe I originally shared here years ago. It’s a downright magical marinade that transforms chicken, pork, shrimp, and veggies into umami-packed meals in a jiffy. Case in point: Fiona’s Phenomenal Fish Packets! I recently shared how to make Fiona’s phenomenal green marinade on Facebook Live, and I also demonstrated how to freeze extra marinade in these nifty silicone ice cube molds. That way, you can pop out a portioned cube of marinade anytime you’re making a desperation meal—something that happens in our house more often than I care to admit. 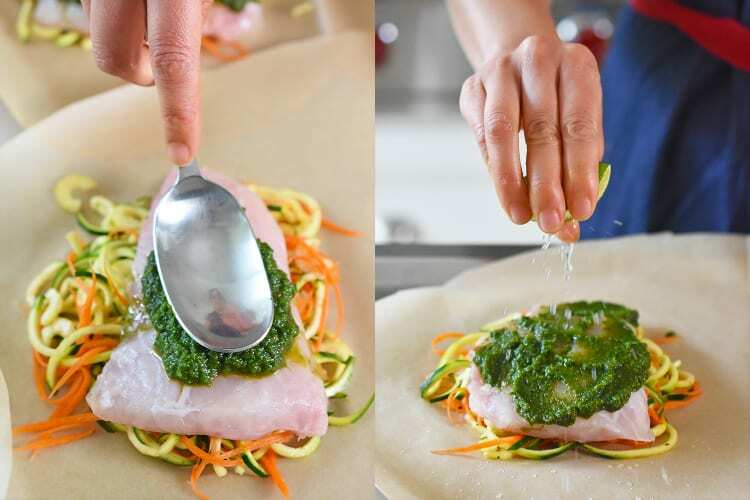 Recently, I’ve been using Fiona’s marinade to flavor fish and veggie parchment packets. 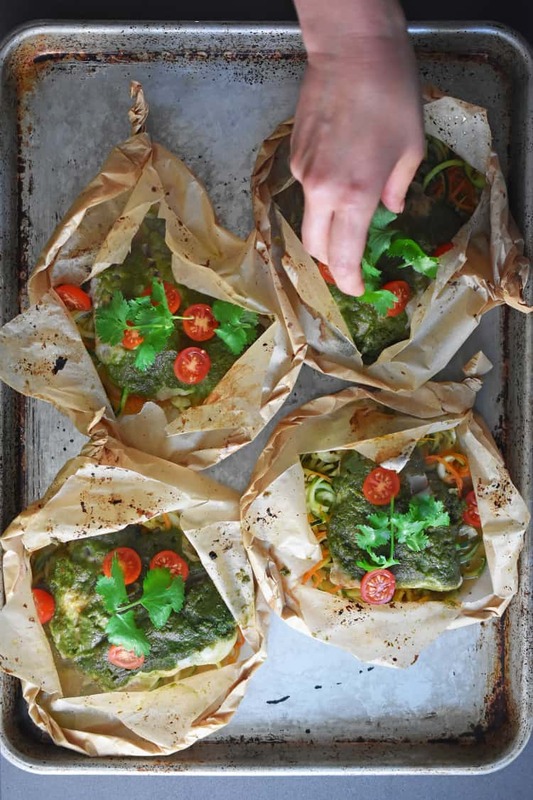 In 30 minutes flat, this herby, healthy dinner’s on the table, and I’m looking like a kitchen hero. 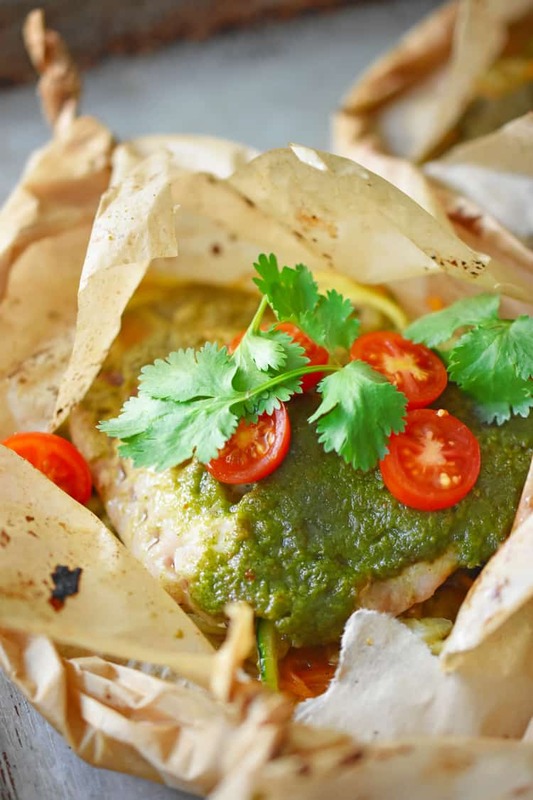 Want to make some Fiona’s Phenomenal Fish Packets together? If you don’t have any leftover green marinade in the freezer, blitz up a batch! Throw all the ingredients for the marinade in a high speed blender and purée until you get a smooth, bright-green marinade. Reserve ¼ cup for this recipe, and freeze the rest in a silicone ice cube tray. The future version of you will thank you later. Preheat the oven to 450°F with the rack in the middle. 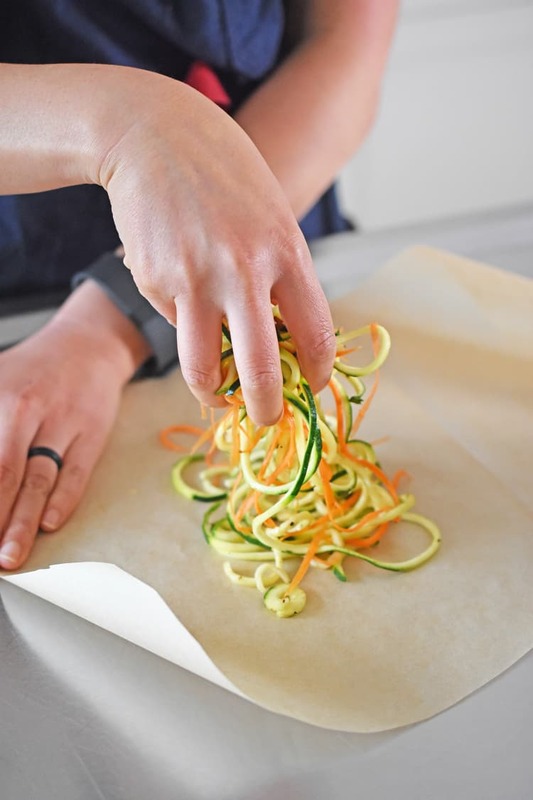 Use a spiralizer, julienne peeler, or your fancy knife skills to cut the zucchini and carrots into thin spirals or matchsticks. Toss the vegetables in a bowl with a little salt—but not too much ’cause the marinade’s well-seasoned. 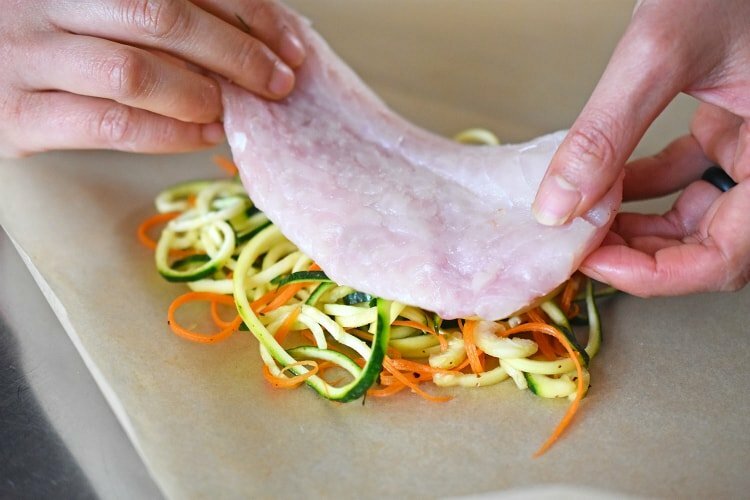 Open up the parchment pieces and lay them flat. 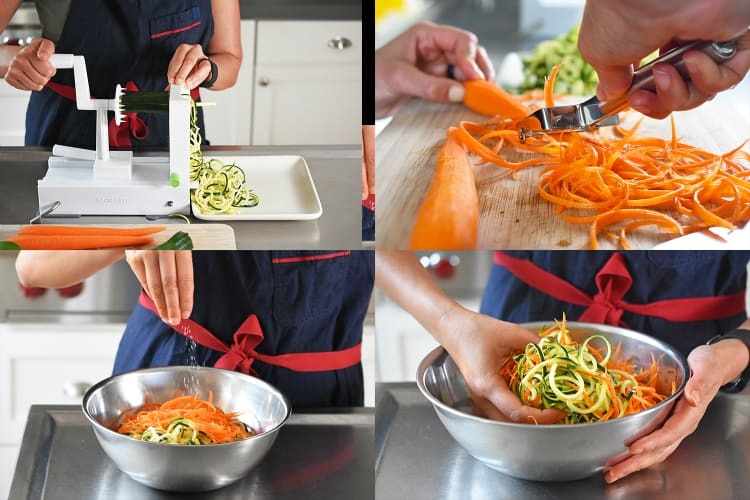 Spread ¼ of the seasoned veggies on one side of the crease in each heart. Place a fish fillet on top of the veggies. Spread a tablespoon of the green sauce on the filet. Squeeze half a lime on the fish and drizzle with ½ tablespoon of olive oil. Repeat with all 3 packets. 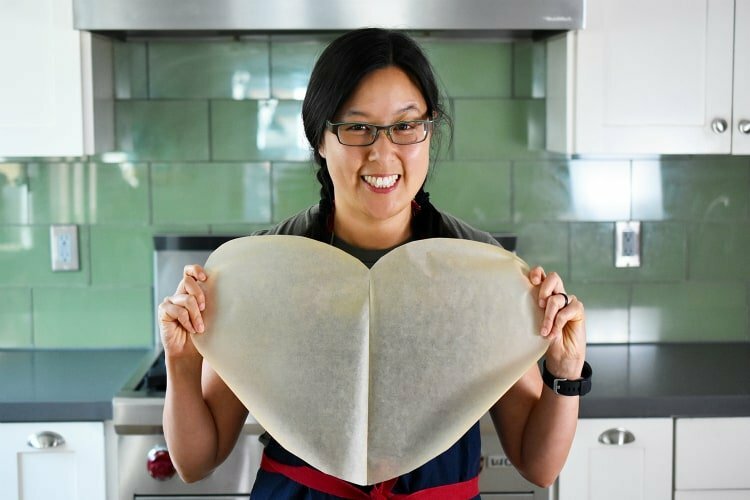 Fold the other half of each parchment heart on top of the fish and tightly crimp the edges together, starting at the top-center of the heart. Make sure each packet is tightly sealed by turning and crimping the edges. At the pointed bottom end of the hearts, twist the paper to seal well. 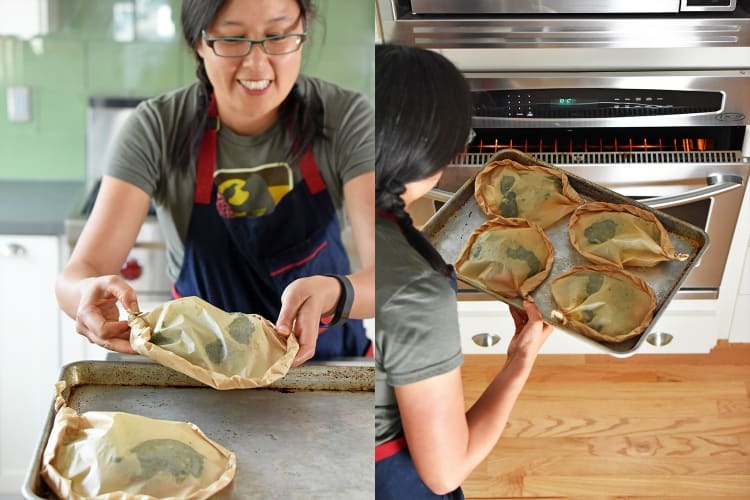 Place the packets on a rimmed baking sheet. Cook in the oven for 7-10 minutes or until the fish is cooked to your desired doneness. If your fillets are thicker, they’ll take longer to cook. 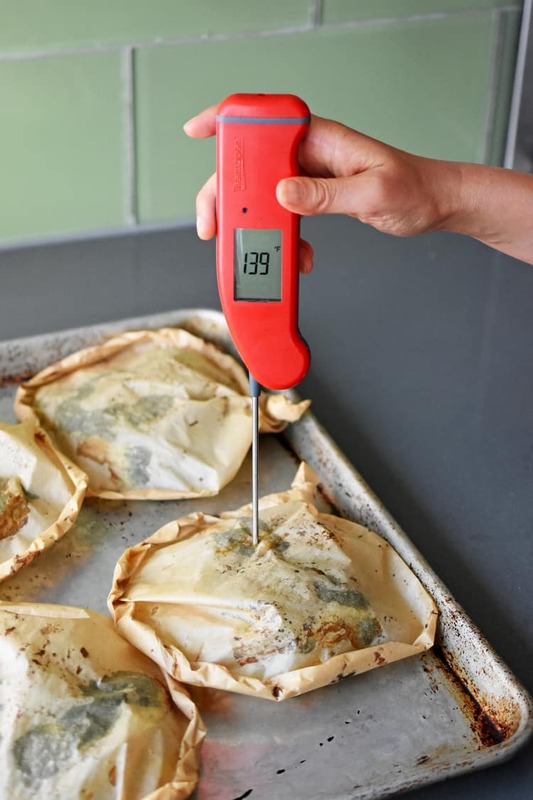 If you’re not sure about whether the fish is cooked through, stab the packet with a meat thermometer to know for certain. 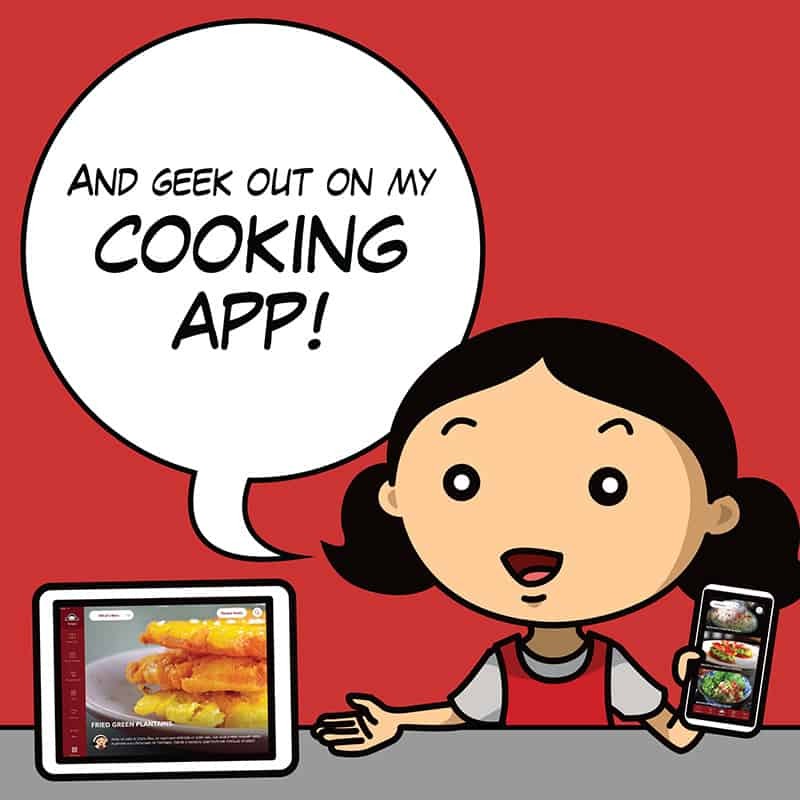 My kiddos like the fish to be flaky and opaque so I aim for a finished cooking temp of 135°F-140°F. 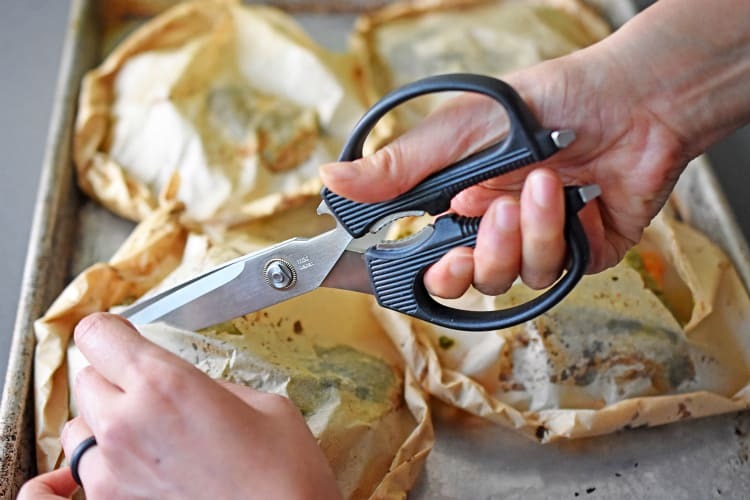 Use a pair of kitchen shears to cut open the packet as soon as they’re done cooking (but be careful—the escaping steam is hot!). Toss a few of the cut cherry tomatoes and optional cilantro garnish on the cooked fish, and serve. 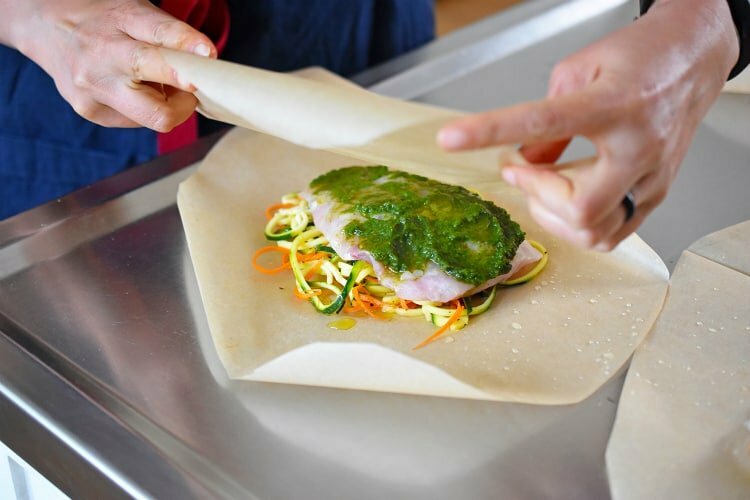 If you’re crazy for parchment fish packets, make my Fish en Papillote (in Parchment) with Citrus, Ginger, & Shiitake! 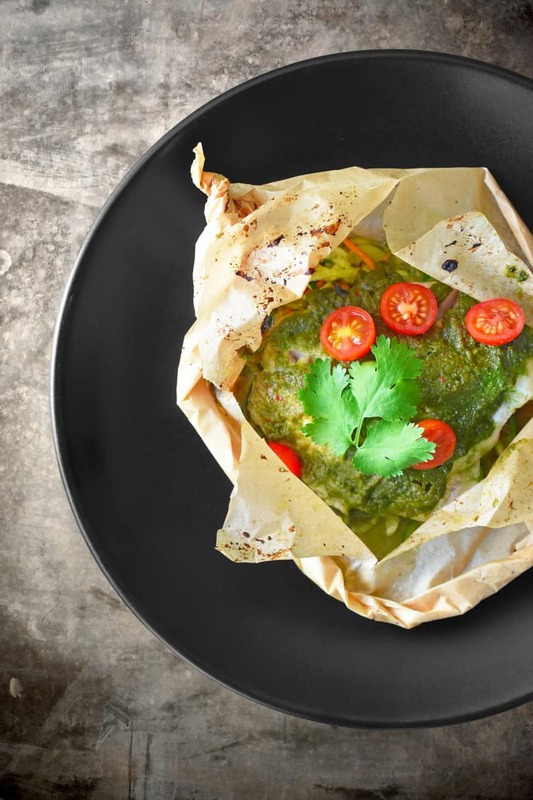 Fiona’s Phenomenal Fish Packets are a delicious Whole30-friendly weeknight supper! My sister’s zippy green marinade is the perfect sauce to flavor fish and veggie parchment packets. In 30 minutes flat, this herby, healthy dinner’s on the table, and you’ll look like a kitchen hero. 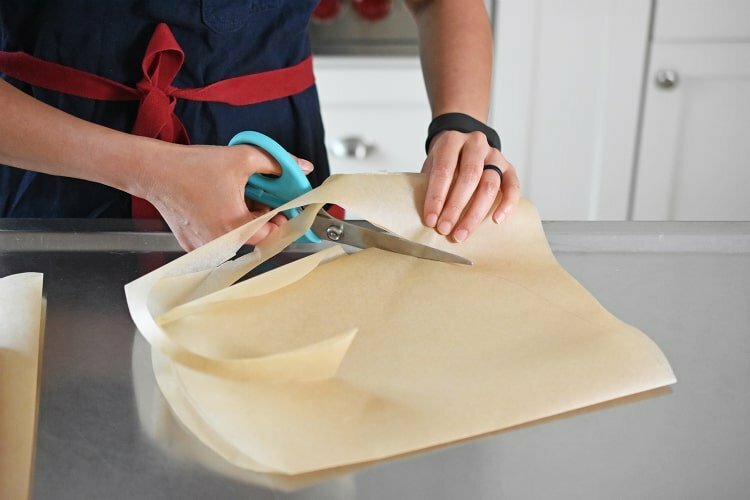 Grab 4 large sheets of parchment paper, and fold each piece in half. Draw half a heart on each piece of paper so that when you cut them out, you get full hearts. Place a fish fillet on top of the veggies. Spread a tablespoon of the green sauce on the filet. Squeeze half a lime on the fish and drizzle with ½ tablespoon of olive oil. Repeat with all 3 packets.